The All Electric/ Total Electric Hot Water Pressure Washers provide smooth, quite performance with no fumes making it ideal for indoor use. Water is heated in high pressure coil immersed in a tank of heated water solution transferring heat to the high pressure water at 180F degrees. Standard features include 7 day heat timer, auto on/off controls with Shut Down Timer, Four Quick Change Color Coded Nozzles, 0, 15, 25 & 40 Degree, 50 Ft Pressure Hose, Shut-Off Gun And Wand. Available With Top (T) or Side (S) Pump Module. 100% Stainless Steel available: recommended for HI and Guam. The hot water pressure washers provide smooth, quiet performance with highly efficient results. 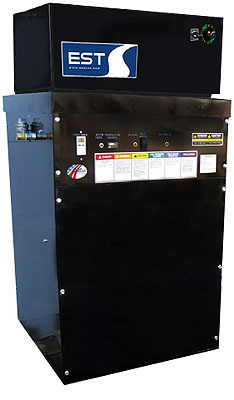 These stationary gas machines are built tough for years of trouble-free service with energy conservation in mind. 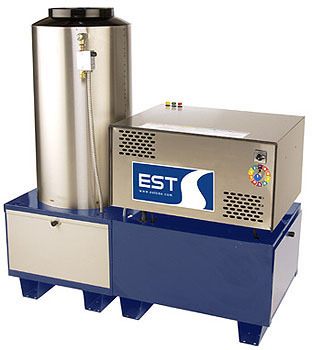 Standard features include stainless steel coil wrap and doors, standing pilot light, adjustable temperature control, optional on NH3010EBND upstream detergent injection (high pressure soap), four quick-change color-coded nozzles - 0°, 15°, 25° and 40°, schedule 80 coil, belt-driven pump, electric motor, shut-off gun, 36” wand and 50 ft. of high pressure hose. Available in all voltages and phases. Most models available in UL.